Sometimes I let the wind and the boat decide where we’re going. My sailing plans are not set in stone. That’s not to say I’ll just go anywhere the wind blows – I managed some self control and skipped my urge to sail south across the North Sea – but if I can, I’ll keep a few options open when I head out. So far it seems like Pyxie enjoys taking me to places with names starting on UT. That’s Norwegian for «out» and as the name suggests, it’s usually remote islands far out in the sea. We went to Utvår when I was en route to Mandal, because the wind started turning and Pyxie seemed drawn towards the island like a magnet. I don’t regret going with that decision for a second. The windswept beauty, the tiny houses and the generous Danish couple that met me represent all that is wonderful about coastal exploration by sailboat. The other day, when heading out from Skudeneshavn (gorgeous town, by the way), the wind and boat made it clear that Utsira was going to be the deal of the day. I had first thought of going there, but then reasoned it was a bit out of the way, and that I might just go up to Røvær instead. But no, Pyxie wanted Utsira. As I approached the island from the south it became evident that sailing into the northern port would be the way to go. The seabeds on the coast of Norway can throw up some strange, breaking seas. The wind was actually a bit more timid than what I would have preferred, and we were ghosting along, never on a perfect track towards the southern port, my sails getting a good flapping in the messy waves. So I listened to the boat, changed course and went around the island to the north. It’s astonishing how quickly seas can change! I rounded the bend and soon I was flying along on a calm sea in the sunset. Bliss! Utsira is quite a little something. 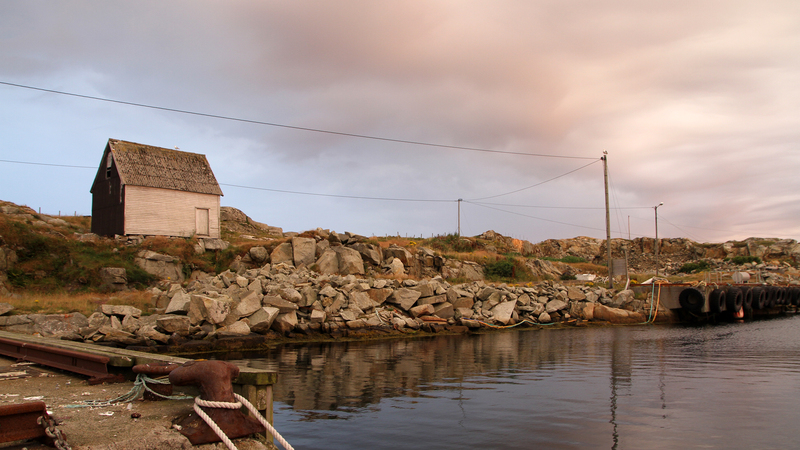 It’s known as the smallest municipality in Norway, with a population of around 200 souls. It’s also known for it’s matriarchal rule in the twenties, with 11 out of 12 representatives being women and of having the first female mayor in Norway, Aasa Helgesen. She was a midwife, a farmer and a mother of eight. 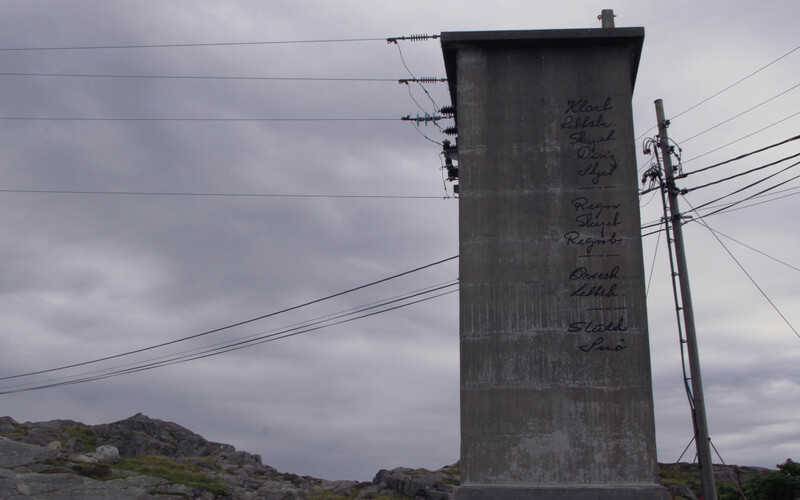 Times have changed, but rather than dying out, the community in Utsira has managed to thrive. There’s still a fishing fleet and farms dotted around. But tourism also plays it’s part, for sure. There are holiday rentals, marked hiking trails, stencil grafitti on the houses, a gastro pub, a wind power station (for good reason, as I will soon elaborate on) and the old lighthouse has been transformed into an art venue, part of the international Pharos project. I was allured by the idea of a sound installation in the form of a bench where you could listen to music by Geir Jenssen (a.k.a. Biosphere), a favourite of mine. But, alas, the bench was nowhere to be found. Or maybe I wasn’t looking properly because I got distracted. There were other interesting installations to explore. 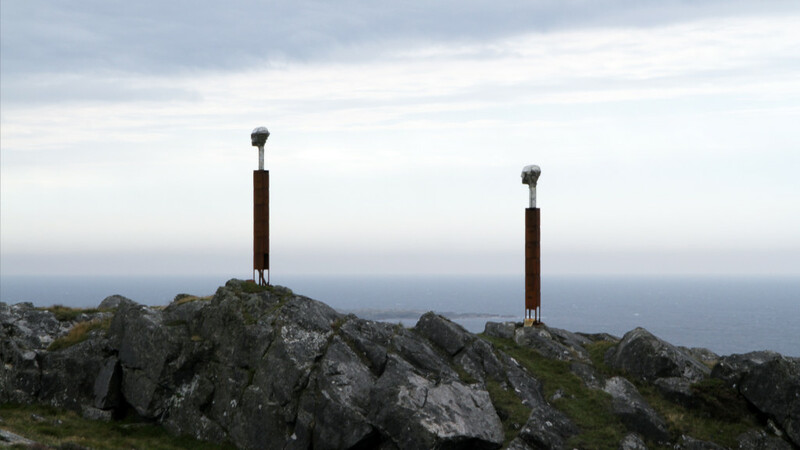 Two heads on giant pedestals, by artist Christian Sunde, staring out to sea. Weather observations on concrete (top photo). A new take on the national coat of arms. I had a grand time exploring the island by foot. Unfortunately I hiked back to the local shop too late to get my portion of take-away komle. Komle is a dish of potato and barley dumplings, served up with salted, boiled lamb or pork, mashed rutabaga and some places a sauce of brunost, the brown, fudgy whey «cheese» we Norwegians love more than life itself. There couldn’t be more appropriate take-away in a place like this. And the fact that it sold out way ahead of time speaks to it’s popularity. I haven’t eaten meat in a long time, and the dumplings aren’t that interesting without the fixings. So I’m ok with missing out. But I still like the idea. Let’s return to the wind. It does blow quite a lot in this place. A gale warning kept our departure is on hold for a few days. Poesi the cat had a bit of digestive distress going on, preventing our leaving when the wind was good. We had a staring contest over the food bowl the other night. I naturally lost, and gave her whatever she wanted to eat. Bad call. She was experiencing what an Indian doctor might describe as «loose motions» and was in no fit state to sail. The next morning she was fit as a fiddle, but the wind was relentless. Pyxie stayed firmly moored. What to do when holed up? Bake bread, read a good book and go surfing! I got on the ferry to Haugesund and went surfing with my friend and old boat neighbour Espen (remember, he popped up in the first blog post from the journey), who is an elite climber and stationed here to build the walls in the upcoming climbing hall, Haugalandshallen. He fixed me a board and we drove out one of the beaches south on Karmøy. Windy, intense and delightful. Heavy seas have their upside! I guess I’m really, truly Norwegian in that sense – I don’t believe in bad weather, only intense weather. Or significant weather, as a meteorologist would probably say. The sea is tremendously powerful. It is a very humbling experience to sail a small boat. But the weather is not bad, not as such. It just is. I’ve screamed at the sea more than once, to no avail. All I can do is adjust the sails, pay my respects and wait it out when needed. Like now. With a cup of tea. Tomorrow morning it just might be calm.